Discussion in 'Puppet News' started by Melonpool, Oct 6, 2008. I've been away from the boards for a bit, but I did something really cool this weekend that I'd like to share... 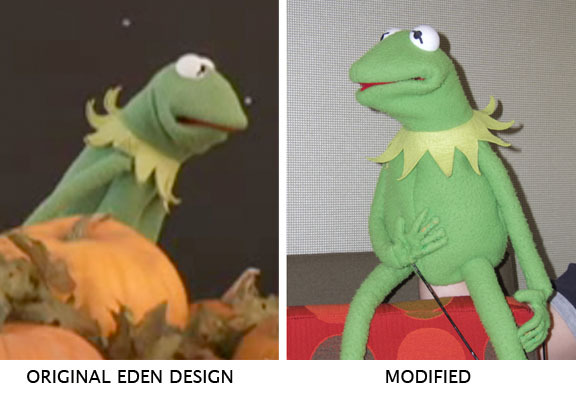 I was able to modify the old (1993) Eden Kermit puppet to make him a lot more usable and more... Kermit-like. I've had that old puppet for about 15 years -- even used him in a little video that got a bit of play on youtube. As you can see, my Kermit had some real issues -- the shape of his head and mouth are probably the most noticeable. Anyway, after talking to Kevin (Muley the Mule's puppeteer) about a year ago, I realized that the stuffing in Kermit's head can be pushed down into his body. With a little work, you can get just about all of it out and make the head a lot more sock-like. This doesn't do a lot for his misshapen mouth, but it does make the puppet a lot more expressive and usable. Last night, I decided to make him a new mouth plate out of gasket rubber. I have the pattern at home and can post it later if anyone is interested, but basically, all I did was put the puppet on, bit the mouth down on a piece of card stock and traced around the upper jaw. On my Kermit, he had a terrible overbite, so I didn't see much of a point of tracing the lower jaw. I also marked where the seam hit on the nose as a center point. I folded the card stock in half, using the seam mark as a guide, and cut out the pattern (this will ensure that the mouth is symmetrical). The final piece should be about 1/8 of an inch bigger all the way around than the red part of hthe puppet's mouth. I then cut about 1/8 of an inch off the back of the pattern, to give a little space on the finished mouth plate for the movement. I made two plates out of gasket rubber and taped them together with about 1/4 inch gap where they join, using gaffer's tape (you can also use duct tape). This will allow the mouth plate to fold and open easily. I turned Kermit inside out. Surprisingly, the outline of the original mouth plate was sewn right into the lining. The beauty of this is that you can just line it up and contact cement the new mouth plate right in place! The new mouth plate should be about 1/4 inch bigger than the old one, so bear this in mind. Also, I didn;t use the brush to apply the contact cement to Kermit -- I wasn't sure what it would do to the fabric -- so I used a scrap piece of foam rubber to dab it on. Once it sets, You can turn Kermit right-side out again. That, pretty much fixed the shape of Kermit's head. I then turned my attention to his collar and hands. The way it was constructed, it looks like they used two pieces of felt glued together to make a stiffer collar. Over the years, the glue had given way, to pretty much give Kermit a double collar -- neither of which stayed down correctly. I turned the top collar up and carefully cut away the lower one. This allowed the upper one to lie flat. Also, the original collar was way too stiff. The single-layer collar corrects this problem. My Kermit's body was way too skinny, as well, so I split the seam on his back to add some more polyfill. I also removed the Eden tag, Once he was sufficiently stuffed (I out my arm inside while I was doing this so he didn't look too fat once I put my arm inside), I stitched up the seam using the ladder (or Muppet) stitch. The last alterations I made was to give him arm rods and finger. Those of you that have the Eden or Applause puppets know that the hands are basically mittens with three lines sewn on to indicate fingers. I always hated this, but I was afraid to try to do something to fix it... but after the success of the other modifications, I figured, what the heck? I took some copper wire and made little finger armatures for both hands, using the "mitten" as a guide. The thumb was left as-is, but I then very carefully cut along each of the sewn "finger lines" to create the four individual fingers. I also pulled the seam at the bottom edge of the hand (opposite the fingers)m to allow access for the rod and to have a hole to insert the armature. Once the armature was in place, I sewed closed the fingers. It's not the prettiest thing in the world (there's not a whole lot of fabric to work with). but once everything was closed up, the posed hands look a LOT better than the mittens. Finally, I inserted a couple of arm rods I had into each hand and stitched them to the inside of the palm and sewed the hands shut. The arm rods I made have a loop at the end, so it was pretty easy to attach them to the hand. I suppose you could use a coat hanger instead, but I had the rods left over from another puppet, so I figured why not use them? Likewise, I'm sure an alternate could be used for the new moth plate, since mouth rubber's not the easiest thing to find, either. It just has to be stiff enough to hold the share and pliable enough to move with your fingers. All told, I spent about 4 hours on these alterations. I needed a Kermit puppet for my Halloween costume, and knew I wouldn't have enough time to build one from scratch. 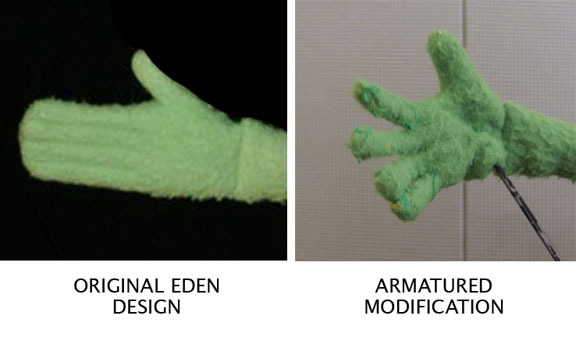 If you have an old Eden or Applause Kermit puppet, these modifications (particularly the ones to the head) will make him work a lot better. I'll post pics later today! Here are the pics. Unfortunately, I didn't take any pictures during the actual process -- or even any "before" pictures, for that matter. I had no idea I'd do so much to it when I started yesterday, I guess. 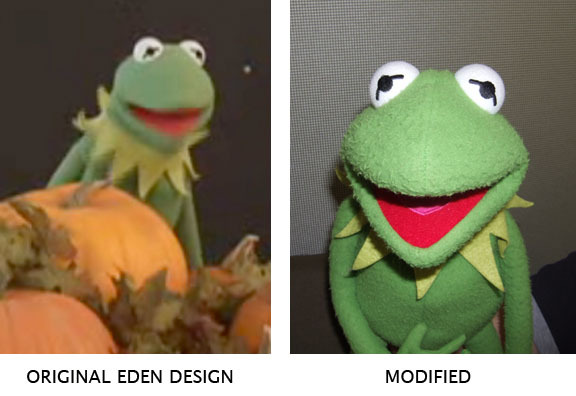 So, I made something of a tutorial for anyone interested in modifying their old Eden Toys and Applause Kermit puppets into something a little more usable. I'm totally on a kick to try modifying some of the other puppets I've collected over the years in similar ways. Maybe I'll start a blog about this sort of puppet modification. Everything I did was a fairly easy project that just about anyone with a little sewing ability could do. WOW! lol this is the 3rd mention i've heard of that, I just joined 2 days ago,HIIIII, its doctorwhoobawooba speaking! Picked up an Eden Kermit and followed most of the instructions. The improvement is immeasurable. I pushed out the stuffing from the head, removed the 2nd collar, and added a make-shift armrod. I also had to play with the stuffing in the arm to give him an "elbow". I don't sew well, so I stopped short of adding more stuffing. I didn't change his mouth either, but I found I re-shape could shape his existing mouth. Thanks for the tips! Excellent! Glad the tutorial was useful for you! I'd love to see some pictures! Sorry, haven't had a chance to post pics yet. I went ahead and stuffed him and reinforced his mouth with cardboard and gorilla tape (didn't feel comfortable gluing it in). I basically did what you did, but I didn't have gasket rubber to work with. As for stuffing him, I opened him up from the inside so my sewing job didn't need to be perfect. I also made one more modification that you didn't mention. I added copper wire to the legs to make them positionable. 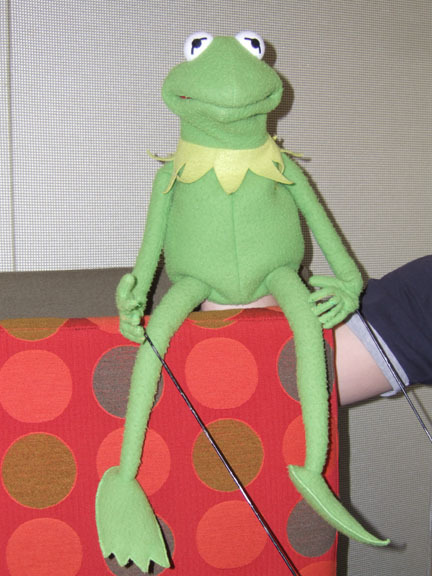 Since Kermit usually sits, I felt it looked better to have him in the sitting position permanently rather than risk his "knees" bending the wrong way. The wires I inserted have a bend at the end that extends into the feet. 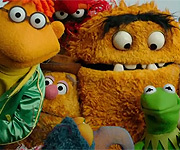 I actually purchased a few Fisher Price puppets too (Animal, Rowlf, Miss Piggy) and modified them as well. Animal and Rowlf were, basically, built with no stuffing. Using a sharp pairing knife I was able to unglue the opening to their arms and legs and stuffed (Animal's arms were stitched closed, so they had to be re-sewn). 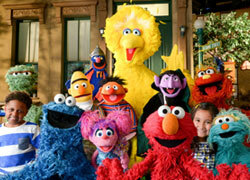 The big challenge was Animal's hands and feet. They appeared to be a single piece of material, but after inspecting I figured out they were 2 pieces of material glued together. Using the knife I was able to carefully separate them. Then I stitched them up at the edges and stuffed them before I was done. I didn't have any wire on hand to make his hands positionable, but that's pretty easy to do regardless. Piggy was a bigger challenge, as her original stuffing had disintegrated and the material that held it in was nearly gone as well. I cut out (or tear out) all the internal material, cut out pieces from the outside of a pillow case (the pillow I was "borrowing" stuffing from) and, as best I could, sewed these in from the inside. To build the cleavage I sewed a single large piece in the front then stitched the division between the top and bottom from the outside. Luckily the stitches are hidden by the loose-fitting dress. I also used some sandpaper to wear down the inside of the rubber head and make it softer and easier to work. Sounds great! I wish I could find my half-converted Gonzo -- it was coming along nicely, but it disappeared during my last move. If I find it during next week's garage sale, I'll post some pictures. I think the old site I had it on got so corrupted that I just let it lapse. I still have the tutorial and the pictures somewhere. I'll try to repost it this week.